After writing about this week’s journaling error I received a few emails asking about the type of software my husband and I use to track our expenses. There are so many different financial software packages to choose from that I’m not sure ho we ended up with our solution: an old version of gnucash, which includes a checkbook-style register to enter all financial transactions. I think my husband chose this software years ago because it was free and it would run on Linux. (Most of the computers in our house don’t run Windows.) Over the years we’ve considered upgrading to a simpler application, but we haven’t found an easy way to port all of our current data into a new system of record. Each month we continue to append all of our transactions and data to the original gnucash file my husband started years ago. It’s a bit frustrating because we know other financial software options exist, but it’s just not easy to jump from one technology to another. We really don’t want to lose track of all of our current data and it would take forever for us to manually move the data over. In other words, it wouldn’t be worth moving the data if we had to do it manually. 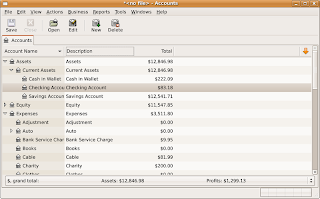 While I’m not a huge fan of gnucash I do like all of the income and expense reports that it can generate. At the touch of a button it can provide a long list of charts and diagrams aimed at providing visual representation of assets, liabilities, net worth. I love to keep track of how much we’re earning and saving and run monthly reports to ensure our monthly expenses don’t exceed our income. 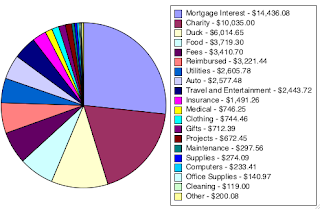 I also generate an expense pie chart to determine where all our money is going. As I mentioned in the early post it helps us visualize where we’re spending money and ultimately helps us figure out what to cut back on. I’m always surprised by how little we actually spend on discretionary items. The majority of our money is spent on mortgages, charitable contributions, utilities, food, utiliies, cars, insurance, medical expenses and our rental property. Thanks for sharing this; I'm trying to find a tool that I'll like enough to use on a regular basis. And I hope this isn't too nosy a question, but… you spent 6k a year on a Duck??? Ha! That's too funny. Our rental home resides in the town of Duck, so that's how we refer to it in the ledger. Is the $744 on clothing for both you and your husband? That's impressive. Would you consider doing a post on how you keep your clothing expenses so low? Have you ever looked at Buddi? It's an open source program that will run on Linux. I've used it on a Mac for several years now, and love all the reports and graphs it'll generate. As for the data you have – there are plugins that will allow you to import certain CSV files.